Yuketen true moccasin footwear are genuine handsewn by highly skilled and experienced leather artisans who take great pride and fulfillment in their work. 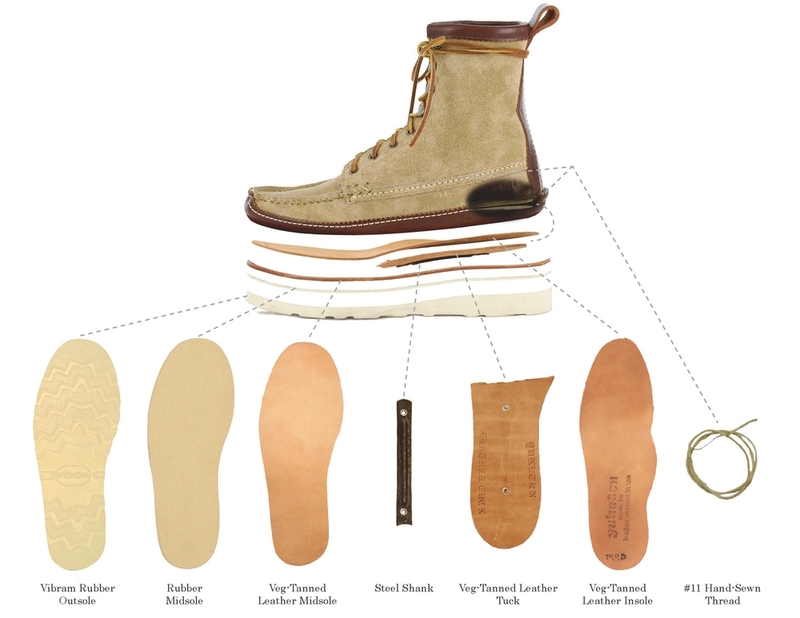 Yuketen’s true moccasins are handmade at Yuketen’s bespoke moccasin factory in Maine, U.S.A. with the concept to create shoes and boots which cradle the bottom of the foot like leather socks. These specialized boots are handmade with the flesh side of full-grain leather tanned in U.S.A. Yuketen’s flesh-out leather is NOT suede because we retain the quality grain side of the leather for thickness, strength, and long-term durability. The sole is Vibram’s soft composition “Cristy” working outsole designed for maximum impact absorption on concrete or asphalt surfaces. Complementary to the sole detail, an exemplary sturdy and comfortable ten layers of highest quality materials (e.g. 100% veg-tan leather midsole, composition rubber midsole, and 100% veg-tan leather tuck) are sandwiched between the lucky owner’s foot and the ground. Indicative of the quality materials in this incredible ten-layer platform combination are Yuketen’s exclusive leather tuck and leather midsole components, which are made from 100% veg-tan leather that is carefully tanned without foreign chemicals and hung to air dry for ninety days; artful leather creation with turn-of-the-century tanning processes from almost one hundred years past. Yuketen’s exclusive veg-tan leather tuck delivers comfort, durability, authenticity, and compelling proof of Yuketen’s indisputable position as a unique footwear innovator for generations to come. The Maine Guide collection, available only from Yuketen, is a heritage collection that is inspired by Maine’s wilderness guides and replete with rugged features including functional and durable patterns designed to endure the elements and the test of time.